Learn bass guitar with this Guitar Tuition DVD. The first DVD in the Learn Bass Guitar series will have you playing all styles of bass guitar in no time at all. 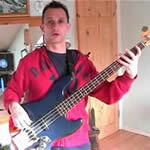 It covers pretty much every aspect of bass guitar in easy to follow lessons and demonstrations. You can even join in some of the lessons and play along!